Women’s boxing has garnered a fair amount of press in the United States of late from the split-draw IBF Female Super Bantamweight title fight between Maureen “The Real Million Dollar Baby” Shea (24-2-1) and Luna “La Cobrita” Avila (12-2-1) on Shane Mosely’s Pay Per View extravaganza, to the announcement that Holly “The Preacher’s Daughter” Holm (33-2-3) will fight UFC’s reigning WMMA champion Ronda Rousey in November on the UFC193 card in Melbourne, Australia. Action will also be heating up in September with a series of bouts featuring East Coast professional female boxers including the return of Alicia “Slick” Ashley (22-10-1) in a WBC Female Superbantamweight title fight on September 15th, Shelito Vincent (14-0) in an 8-rounder at Foxwoods Casino on September 12th (with the top of the card broadcast on NBC), Ronica Jeffrey (13-1) in a 6-rounder on September 11th, and Amanda Serrano in a 6-rounder on September 10th. 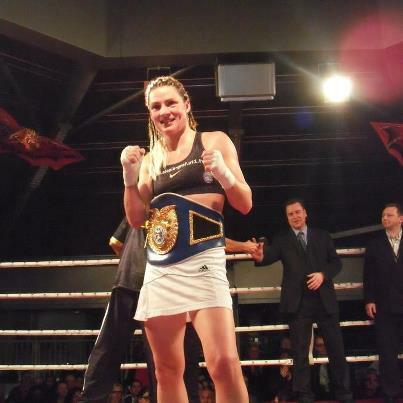 Added to that mix will be Australian boxer “Shotgun” Shannon O’Connell (11-3) making her North American boxing debut in Toronto against Canadian fighter Sandy “Lil Tyson” Tsagouris. The two will battle in an 8-rounder on the undercard of a PBC/Spike TV card headed by the Adonis Stevenson v. Tommy Karpency WBC World light heavyweight title fight. Ahead of her fight, Shannon O’Connell along with two-time world champion Susie Q. Ramadan (23-3) have embarked on a tour of the U.S. with their trainers, promoter Lynden Hosking of Hosking Promotions and U.S. advisor, Eddie Montalvo. 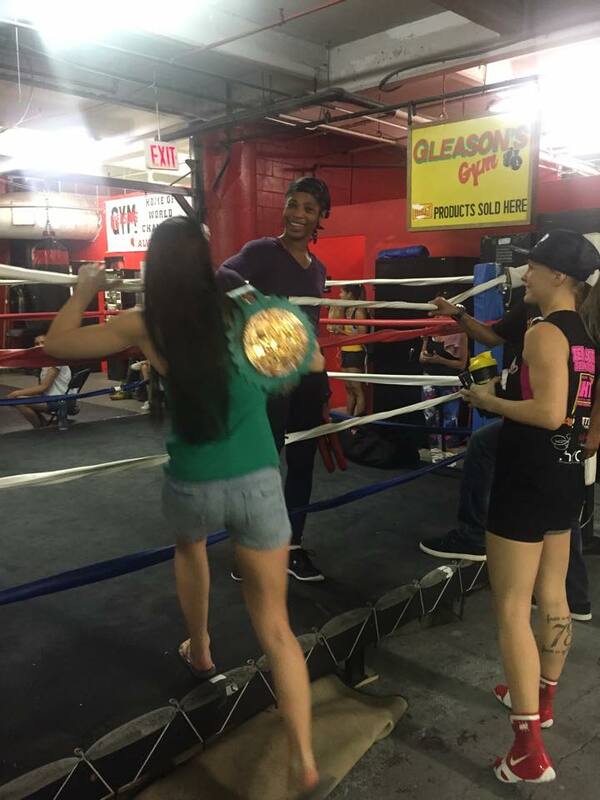 The tour has led the two fighters to New York City, and the world-famous Gleason’s Gym where both women had the opportunity to meet with the likes of Keisher “Fire” McLeod, Ronica Jeffries, Melissa St. Vil, Alicia Ashley, and Heather Hardy–a veritable who’s who of women’s boxing champions. 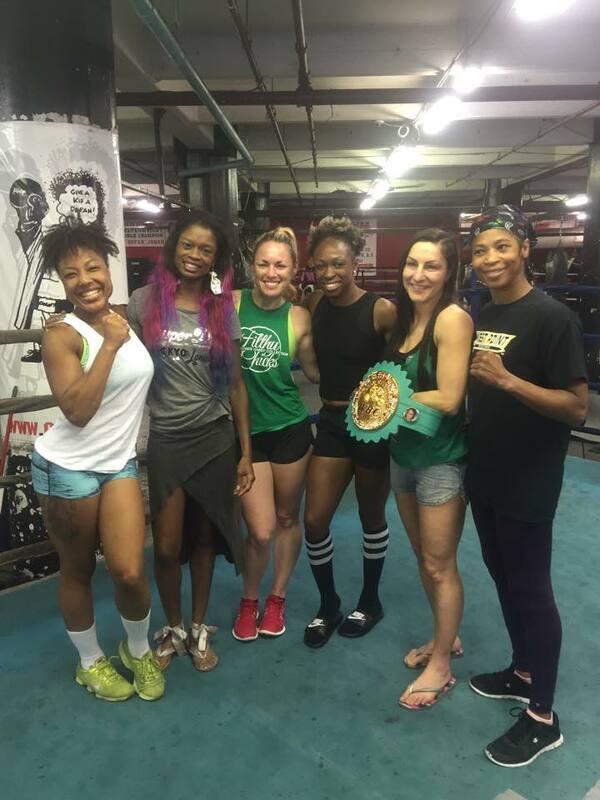 Girlboxing had a chance to meet and talk with O’Connell, Ramadan, promoter Hosking and Heather Hardy who sparred Ramadan for three tough hard-fought rounds. While the interviews were brief, the sentiment expressed was one of optimism for the sport over all and most importantly of the need for connection and support among the fighters as they battle for recognition and opportunities to practice their art. >>>In Guadelajara, Mexico, Mariana “La Barbie” Juarez (36-6-3, 16-KOs) defeated Japan’s Tenkai Tsunami (18-6, 7-KOs) after ten rounds of boxing by unanimous decision. Juarez was in command of the ring through out with Tsunami showing wobbly legs in the fifth and sixth round. La Barbie, coming off her loss to Ava Knight, should feel good at getting a fight into the “w” column as she hunts around for another title shot. Interview with Mariana Juarez, post-fight (in Spanish). >>>In Seoul, South Korea, Ju Hee Kim (17-1-1, 7-KOs) successfully defended her WBF World Light Flyweight Title on Saturday night defeating Thailand’s Ploynapa Sakrungrueng (9-3-0) by TKO in the 10th round. This was Kim’s third title defense and second title match against Sakrungrueng whom she defeated by TKO in the 6th round at their first meeting this past March. Kim fought a tough match pressuring Sakrungrueng throughout. By the 10th round, the referee felt that Sakrungrueng had taken enough punishment and stopped the bout. >>>Alesia Graf (26-3-0, 10-KOs) came out a winner last night when she defeated Liliana Martinez (10-12-0, 5-KOs) for the WBF Female Super Bantamweight Title at the Mitsubishi-Autohaus Gratzke in Stuttgart, Baden-Württemberg, Germany. Graf claimed victory in the 6th round of the 10 round bout. 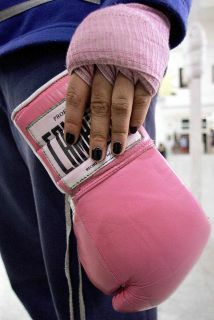 Some big Women’s boxing bouts on Saturday, 12/15/12! Layla McCarter will be fighting Belinda Laracuente on Saturday night, 12/15/12 in Las Vegas. The big female bout this weekend on Saturday, December 15th, will be pitting Mexico’s super flyweight Mariana “La Barbie” Juarez (35-6-3, 16-KOs) against Japan’s own aptly-named Tenkai Tsunami (18-5-0, 7-KOs) in a ten round main event at the Arena Coliseo, in Guadalajara, Jalisco, Mexico. The fight is being promoted by Canelo Promotions, Golden Boy Promotions and Boxeo de Gala, and will be televised on Mexico Televisa and FOX Espanol. 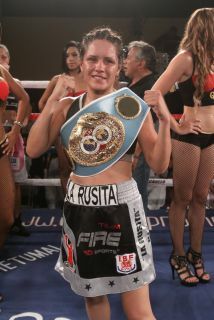 Juarez is coming off her loss by unanimous decision to Ava Knight for the WBC Female Flyweight Title this past October. Tsunami has lost her two most recent ten round bouts, in this past October and July respectively, but had a nine-fight winning streak prior to her two losses. In Las Vegas, the great pound-for-pound boxing champion Layla McCarter (35-13-5, 8-KOs) will be fighting Gleason’s own Belinda Laracuente (26-27-3, 9-KOs) in what for them will be a six-round “walk in the park” given their previous meetings which included their history making ten-round classic with count ’em, three-minute rounds. The bout is being promoted by Sterling Promotions, but it does not appear that it will be televised — our loss! 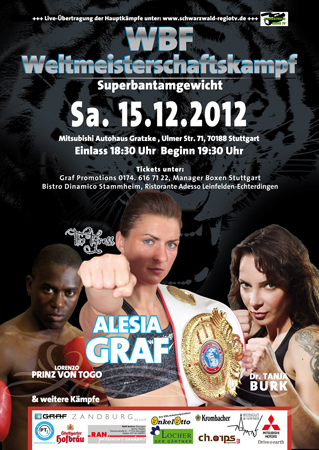 Alesia Graf (25-3-0, 10-KOs) will be fighting Liliana Martinez (10-11-0, 5-KOs) for the WBF Female Super Bantamweight Title at the Mitsubishi-Autohaus Gratzke in Stuttgart, Baden-Württemberg, Germany. Also on the fight will be a four rounder with lighweights Derya Saki (3-0, 1-KO) fighting Chrisoula Mirtsou (0-1-0). Alesia Graf, who is also listed as the promoter for the three-fight card, won the title against Thai fighter Jubjang Lookmakarmwan (3-5-0). Graf is probably best known for losing to Australian fighter Susie Ramadan last February for the vacant WBC International Female Bantamweight title by split decision, 96-94, 94-96, 96-94. She was also cut above her eye in the bout. 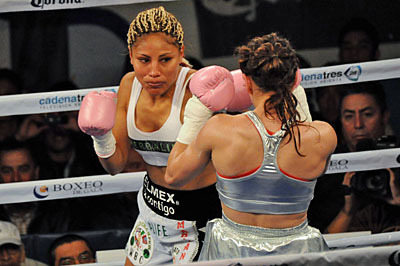 Martinez, fights out of the Dominican Republic and while she recently fought two four-rounders this past October and November, had been on an two-year layoff following her defeat by Maureen Shea for the six-round vacant NABF female lightweight title in July 2010. She lost by TKO in the third round. In Seoul, South Korea, Korean fighter Ju Hee Kim (16-1-1, 7-KOs) will be defending her titles against Thai boxer Ploynapa Sakrungrueng (9-2-0). The four light flyweight titles on the line are from the WIBA, WIBF, WBF and Global Boxing Union. The two last fought in March 2012 with the 26-year-old Kim taking the titles by TKO in the sixth round of their ten round bout. Meanwhile, the two big fight cards in the United States this weekend: The Nonito Donaire card (10 fights in all) at the Toyota Center in Houston, Texas to be broadcast on HBO, and the Amir Khan card at the Sports Arena in Los Angeles, California (13 fights) set for Showtime — there is nary a female bout on either card. What gives??? Wordless Wednesday Video: Ramadan v. Rivas, IBF Female Bantamweight Title Bout! Only problem, there doesn’t appear to be any sound — upside?? You get to make the calls! Mexican flyweight, Yazmin Rivas (23-7-0, 9-KO’s) won the vacant IBF Female Bantamweight championship title last night against Australia’s own Susie Ramadan (21-1-0, 8-KO) by unanimous decision after ten rounds of boxing at the Centro Internacional de Convenciones in Chetumal, Quintana Roo, Mexico. The judges scored the highly competitive bout 97-93, 97-93, 96-94 in favor of Rivas who also won the vacant NABF Women’s Flyweight title back in July against Gabriella Gonzalez (5-3-0, 1-KO). In a second fight on the same card at the Centro Internacional de Convenciones, Mexican fighter Janeth Perez, (14-0-1, 4-KOs) successfully defended her WBA Female Bantamweight championship title against Yanina Natalia Acuna (10-4-2 (3-KO) by unanimous decision. The judges scored the bout 99-91, 98-92, 99-91 in favor of Perez who had previously won the vacant title in July 2011 against Argentinian fighter Yolis Muffago Franco (10-5-2, 3-KOs). Over at the Gimnasio Revolución in Calpulálpan, Tlaxcala, Mexico, Mexican boxer and WBC Female Flyweight title holder Mariana “La Barbie” Juarez (31-5-3, 15-KO’s) overpowered Uruguay’s own Gabriella Bouvier (7-2-1, 1-KO) by TKO at 1:12 into the fourth round of the bout. This was their second meeting since Juarez defeated Bouvier for the title in May 2011 and was Juarez’s third defense of her title.